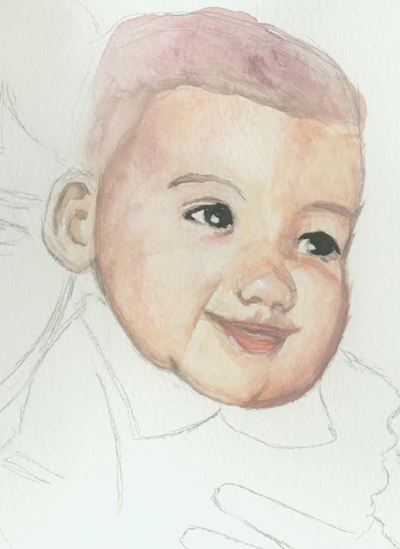 I started on my sister’s face, but was totally not feeling it. I had run out of the skin tone I had been using all along and had to make a new batch that just wasn’t exactly what I wanted. I battled with it for an hour and then gave up for the night. Forging on in that mood was going to lead to more mistakes. Tomorrow is another day. Maybe I’ll get back into the zone. If there is one thing you can say about my city its that it gives up an appalling number of interesting mugs to the local Goodwill store. I, of course, am the benefactor of their poor taste. Just look at this classic Schwinn brand bicycle mug! It does have a few annoying chips on the bottom of it and the handle has seen better days, but come on people! It shouldn’t be left next to Precious Moments mugs at the Goodwill! I am not sure where my affinity for mugs came from. I never was particular as a child when it came to things I drank out of. Clean would do. Not, in a pinch. When I went to college I got a set of those ridiculously dull oatmeal/greyish dishes from a resale shop and was proud of having a complete set of something as we just had mishmash growing up. By my senior year I was missing a mug out of that set. I was furious. My roommates were less than responsible about property as they had everything handed to them their entire life they couldn’t understand why I was bothered by a missing mug that ruined my set. Of course they couldn’t understand that it was my very first complete set of anything. My leading theory was that they accidentally broke one, ground it up, and blew it out the screen window to get rid of the evidence. Relationships had soured to that point for reasons beyond missing mugs. It was just one more thing on the list. After college I moved out on my own and took my incomplete set of dishes with me. I also started buying cute mugs from the Goodwill. One at a time or in pairs. At first it was because I was trying to fill the gap that missing mug left and to round out the number, but eventually it was just because I liked rescuing “missing” mugs from an otherwise lackluster existence on the random dishes section of Goodwill. And over the years I’ve pushed those sad, incomplete mugs to the back of the cabinet. One recently made an appearance as a vessel for my paintbrushes. It seems variety has cured me of my “complete set” angst. Something a little more realistic. Look, a baby picture! Me actually. And my sister. I cropped into the portion I am working on now. There will be a dark background which explains some of that sloppiness around the cheek bone. I need to go back in and try to scatter some of the harsher transitions in the skin tone and the bridge of the nose needs something done to it. And the left eye needs to be addressed. Otherwise, that’s me! Sketching and painting took me just over an hour.